The Bucheon project is located half way between Seoul and Songdo, about 30-45 minutes outside central Seoul CBD. It is a well-established neighborhood, densely populated, with train access to Seoul center 3 blocks from the site. 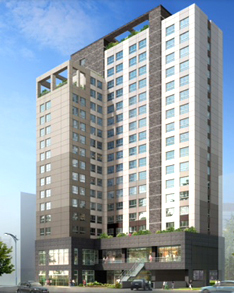 Phase 1 is comprised of 150 apartments and 200 officetel unts, while Phase 2 is 204 apartments and 190 officetel units. The project type is a new type of zoning regulation called “city living” which is residential zoning for smaller apartments, yet designed like officetel. This new zoning type was created to address the high demand housing in densely populated areas in Seoul metro area. “City Living” units are selling at higher prices than officetel units because residential zoning is less restrictive than commercial officetel.